Taylor is a native Alabamian and, with the exception of a stint in New York City, Alabama has remained his home. He has lived in Birmingham for the past nine years since graduating from the University of Alabama at Birmingham (UAB) with a bachelor’s degree in theatre. Taylor also works as a professional photographer. Taylor has enjoyed six years of extensive experience working in client services, patient care, skin care and practice marketing. Before coming to Seiler Skin, he worked for Chanel Cosmetics, interned with a renowned photographer in New York City and worked as a patient coordinator with a local plastic surgery center and spa. 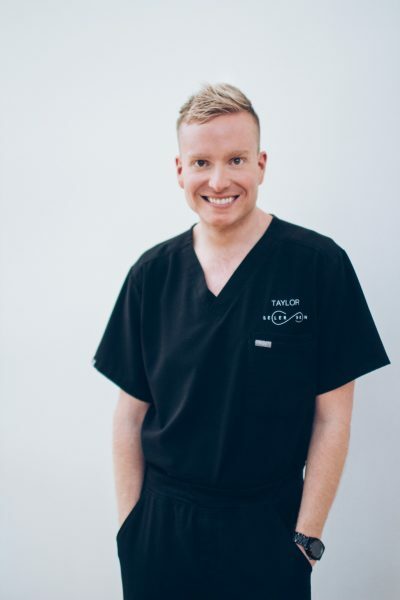 At Seiler Skin, Taylor has had extensive training under Dr. Seiler to perfect his knowledge of cosmetic laser and injection procedures, which has enabled him to assist him in patient treatment planning and new patient coordination. Like all team members, Taylor partakes in all education and training sessions on a recurring basis at the practice with Dr. Seiler. Taylor is one of two patient coordinators. He will greet you with a big smile! He enjoys helping new patients understand the consultation process and the planning of their treatment course. Taylor takes pride in being able to answer any patient question in person or over the phone. In addition, Taylor is our staff photographer capturing photos and videos for our social media platforms. He strives to be a partner with patients providing any assistance necessary for their Seiler Skin experience to be positive and successful. Taylor resides in Mountain Brook, allowing him to enjoy the pulse and heart of the city. He is the owner of Taylor Campbell Photography, which focuses on wedding and fashion photography. You can find him getting his hands dirty at Shoppe on weekends, and trying out the many new and eclectic restaurants in the Magic City. Additionally, he is active at Phase gym in Lakeview and frequently is a foster parent for the Greater Birmingham Humane Society. Taylor’s recent blog post: Am I a good candidate for the P-Shot?